Goodbye Big Island, Hello Maui | So Many Exciting and Beautiful Places! Our last full day on The Big Island, so we kept it easy. We went to King’s Shops and visited the shops we had missed the first time. I especially enjoy the art galleries that feature work by local artists. 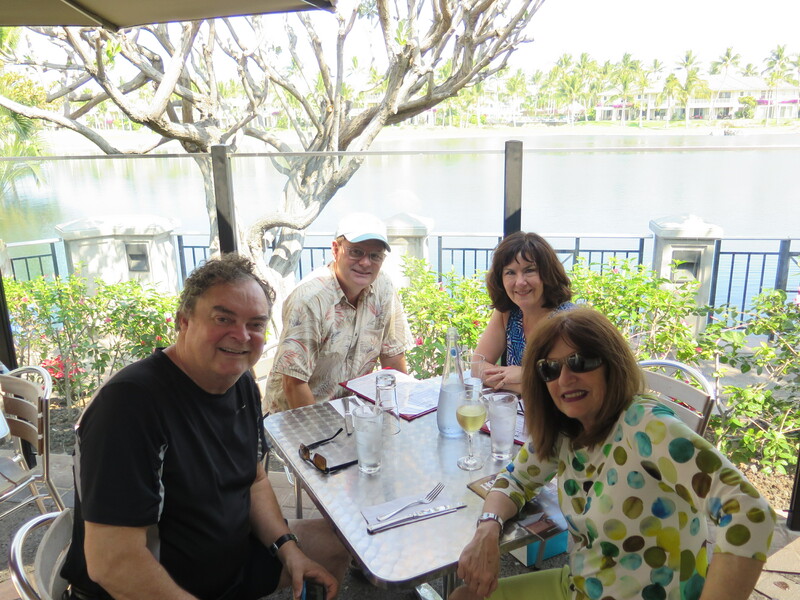 We had lunch with Jeff and Sally at Three Fat Pigs, which had outdoor dining along the lagoon. Lava Lava Beach Club is known in the area for its fabulous sunsets. The restaurant is on the beach, so we were able to watch the wave action and at least one surfer. As sunset approached, many of the diners lined up to get their photos – it really was impressive. Our flight was at 1:00, which gave us time to stop for coffee at a Kona Mountain Coffee Shop just a couple miles from the airport. This airport is fairly small, and the waiting areas are outside, so we continued to enjoy the lovely air. The flight to Maui is very short. We were barely aloft when our descent began. Maui’s airport is larger than Kona’s, but still small enough to make it easy to navigate. After picking up our rental car, we drove to Wailea where our condo is located. The grounds are beautiful, as is the condo. For dinner, we went to Manoli’s Pizza where we had another great view of the sunset.